Greg Zuerlein kicked a 57-yard field goal in overtime as the Los Angeles Rams overcame a 13-point first-quarter deficit to defeat the New Orleans Saints, 26-23, in the NFC championship game Sunday in New Orleans, advancing to Super Bowl LIII. The field goal three minutes, 17 seconds into overtime came five plays after John Johnson III intercepted a wobbly pass by Drew Brees at the Rams’ 46-yard line. Brees was hit by Rams outside linebacker Dante Fowler Jr. as he threw. Johnson made the interception on the turf as he fell after Saints receiver Michael Thomas made contact with him. Jared Goff began the drive with a 12-yard completion to tight end Tyler Higbee. C.J. Anderson was tackled for a three-yard loss on the next play. Goff completed a 6-yard pass to Higbee that advanced the ball to the New Orleans 39-yard line. Goff’s third-down pass was incomplete, bringing out the field goal unit. McVay will turn 33 on Thursday. The previous youngest coach to coach a team to a Super Bowl was Mike Tomlin, who was 36 when he coached the Pittsburgh Steelers to the victory in Super Bowl XLIII in 2009. The Rams will play in the Super Bowl for the fourth time in their history and second when they were based in Los Angeles. They also played in the NFL championship game five times before the Super Bowl was established in the 1966 season, including once when they were based in Cleveland. The Rams won one NFL championship when based in Los Angeles in 1951. The Rams will face the New England Patriots in Super Bowl LIII Feb. 3 in Atlanta, exactly 17 years after the Rams most recent Super Bowl appearance, a 20-17 loss to New England, the first of the Patriots’ five Super Bowl titles. New England was a 37-31 overtime winner over the Kansas City Chiefs in the AFC championship game played later Sunday in Kansas City. Saints coach Sean Payton said the officiating crew “blew the call” by not calling pass interference against Rams cornerback Nickell Robey-Coleman on a third-down pass intended for Tommylee Lewis with 1:49 to play and the ball on the Rams 13-yard line. Brees completed 26 of 40 passes for 249 yards and two touchdowns before an often-noise crowd at the Superdome announced at 73,028. The overtime interception was New Orleans lone turnover. 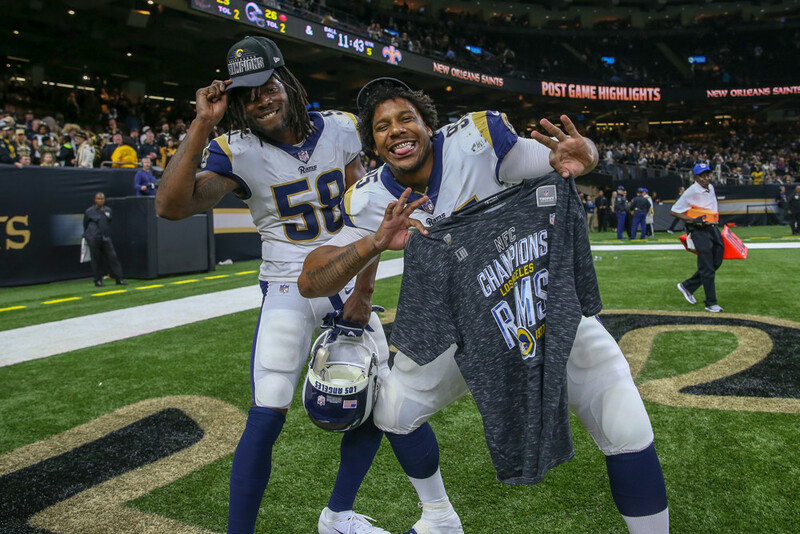 The Rams victory ended the 10-game winning streak by the home team in the NFL’s conference championship games along with the Saints seven-game home postseason winning streak. Zuerlein kicked a 36-yard field goal 5:15 into the second quarter for the Rams first points. The Rams got their first down of the game on the drive, with punter Johnny Hekker throwing a 12-yard pass to Sam Shields, usually a cornerback, out of punt formation. Griffin was the No. 4 tight end on the Saints’ unofficial depth chart released by the team Monday. He was pressed into duty because first-stringer Benjamin Watson was not in uniform due to an illness and second-stringer Josh Hill was sidelined by a concussion, a team official said. New Orleans took the opening kickoff, picked up three first downs, drove to the Rams 19-yard line, where Brees’ pass on third-and-7 was incomplete, forcing the Saints to settle for Lutz’s 37-yard field goal.